Boston's long-running whodunit Shear Madness is finally here bringing NYC audiences to hysterics, and leading the charge is a former star of the Boston production, Jordan Ahnquist. The IRNE Award nominee steals the show as the interactive comedy's flamboyant and hilarious salon owner Tony. Below, he talks to BroadwayBox about making the leap from Boston to NYC, finding joy in the outdoors, and why he wants to hear from you on Facebook. Opening night of Shear Madness NYC, will, of course, stick with me forever, but the most memorable for me was the first show in Boston after the Marathon bombings. A large part of the city was still on lockdown as the authorities did their heroic work tracking down the suspects, and we weren't sure whether it was appropriate to do the show with the tragedy lingering in the air. Most of the audience had cancelled or rescheduled but about 15 people decided to show up. Our director talked to us backstage saying, that for whatever reason these folks decided to show up so we're going to do our job as best we can. They were a small but mighty house, and one audience member was wearing his medal for finishing the marathon a few days earlier. After the show, he made a point to thank us for making him laugh, and for providing a respite from the stresses we'd all been feeling. It was a wonderful reminder of how important laughter is. It's a privilege to provide that for people. I'll never forget that night. I love Robin Hood Men In Tights. I know this is controversial among Mel Brooks aficionados but I love that movie. Come on, "No, I didn't say Abe Lincoln, I said hey Blinkin'!" Colonel Mustard because he pairs well with hot dogs. My niece and nephews... Oh and my sisters, of course, my sisters. His infectious buoyant spirit and eternal optimism. The Barnstable High School Drama Club production of On the Twentieth Century I saw when I was in 5th grade. My sister was a mean Mrs. Primrose. And then Primal Fear with Ed Norton. Ed Norton was an even meaner alter boy. Well I'm new here so I'm still looking. Right now hanging with my cast backstage at New World Stages is a delight. But if anyone knows a spot that smells like a wood burning stove and feels like a hike in New Hampshire, message me on Facebook. Seriously. Either Peaky Blinders or The Unbreakable Kimmy Shmidt—I'm not sure the exact timeline. But Tony might have had few Titus-isms for a week or two. Pinot noir for life. Outside. In whatever weather is happening. I love a hike in the mountains or a walk through the woods. I was fortunate to grow up on Cape Cod, and visiting a blustery beach in the off season is one of my favorite ways to ground myself. If I'm outside biking or swimming there's even more joy to be found. 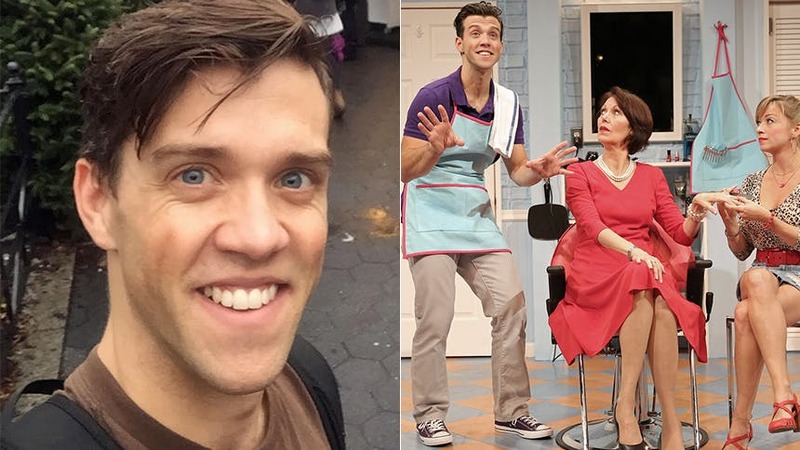 Get ready to laugh with Jordan Ahnquist and the cast of 'Shear Madness' at off-Broadway's New World Stages.